The continued pursuit of breakthrough technology and performance by Titleist golf ball engineers has resulted in the all-new Titleist Tour Soft golf balls, now available in golf shops worldwide. For golfers demanding better feel, the invention of Titleist Tour Soft – the softest-feeling golf ball in its category – delivers a better performance experience. Tour Soft’s innovative design combines the largest core ever engineered into a Titleist golf ball with ultra-thin cover technology to provide responsive feel, very fast speed for commanding distance and excellent short game performance. NEW TITLEIST TOUR SOFT: Category-leading soft feel, commanding distance, excellent short game performance. • The largest Titleist core ever produces category-leading soft feel and high ball speed for commanding distance. In developing Tour Soft’s core, the Titleist Golf Ball R&D and Operations teams were challenged to surpass previously accepted core size limitations in order to produce a golf ball that feels better and is as long or longer than the competition. • A new ultra-thin 4CE grafted cover made with TCU Process Technology generates advanced short game control. Innovations in the manufacturing process at Titleist Ball Plant 2 in Massachusetts allowed engineers to mold the extremely thin, very soft cover formulation – made from a proprietary blend of four different materials – uniformly across the surface. • A new spherically-tiled 342 cuboctahedron dimple design, optimized for the new Tour Soft construction, delivers a penetrating trajectory and consistent flight. • Tour Soft is available in both white and high-optic yellow. 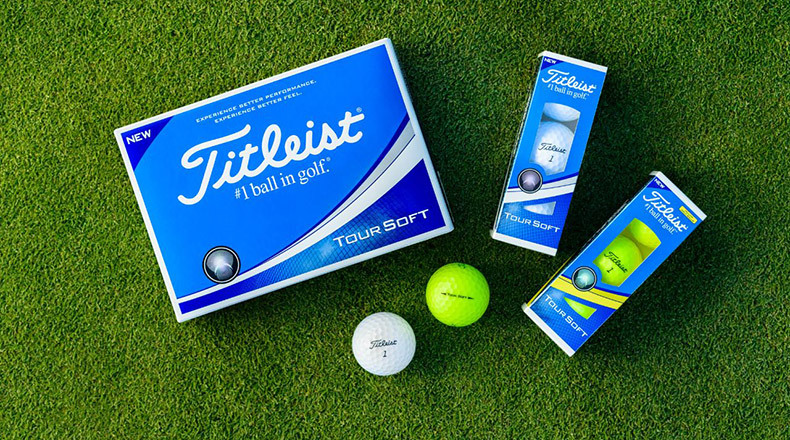 More than 19,000 golfers participated in the white box testing and validation process for the new Titleist Tour Soft, with golfers receiving prototype golf balls for on-course evaluation. Player feedback was then gathered through Team Titleist and shared with Titleist R&D. This included a three-ball blind prototype test in January 2017 that led to some key insights toward the Tour Soft development. AVAILABILITY: New Titleist Tour Soft golf balls are available in golf shops worldwide beginning Jan. 24, 2018.